A formal extradition request has been made to Russia by the UK, for the ex-KGB agent wanted over Alexander Litvinenko's murder. It follows the recommendation by the UK director of public prosecutions that Andrei Lugovoi be tried for the crime. Mr Lugovoi denies the charges, and the Kremlin says Russia's constitution does not allow it to hand him over. Former KGB officer Mr Litvinenko died in London in 2006 after exposure to the radioactive isotope polonium-210. The British embassy in Moscow has confirmed that the formal extradition request has been handed over, and the Russian prosecutor's office has confirmed that the documents have been received. Mr Lugovoi maintained last week that he was innocent and described himself as a "victim not a perpetrator of a radiation attack" while in London. He has called the charges "politically motivated". Mr Lugovoi met Mr Litvinenko on the day he fell ill.
Polonium-210 was found in a string of places Mr Lugovoi visited in London, but he has insisted he is a witness not a suspect. The UK's director of public prosecutions Sir Ken Macdonald said Mr Lugovoi should be extradited to stand trial for the murder of Mr Litvinenko by "deliberate poisoning". But the Kremlin maintains Russia's constitution does not allow it to hand over Mr Lugovoi, a position reaffirmed by the country's justice minister Vladimir Ustinov last week. "The Russian constitution will stay inviolable and it will be observed to the full," the news agency Itar-Tass quoted him as saying. It is possible Russian prosecutors might decide to arrest and try Lugovoi in Russia. The prosecutor general's office previously said Russian citizens could not be extradited to a foreign country but could appear in a domestic court "with evidence provided by the foreign state". 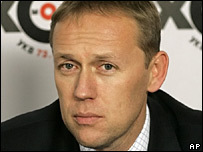 Mr Litvinenko, who was a critic of Russian President Vladimir Putin, was granted political asylum in the UK in 2000.